Yellow flag iris is a lovely and notoriously invasive exotic; it spreads fast, clogging wetlands and choking out native species. Digging out iris in vulnerable wetlands is hard work, requiring plenty of bending, and it’s always muddy. But some volunteers claim it’s their favorite stewardship event! We’ll be working in a tidal marsh, digging up plants and hauling them out of the marsh to our pickup trucks. (The plant’s seed pods float, making it imperative that we remove them from the marsh.) Wear rubber boots and gloves; NCLC will provide the needed tools. Bring your own drinking water and lunch. There are no toilets or potable water on site. If you’d like to help, contact NCLC Stewardship Director Melissa Reich at 503-738-9126, melissar@nclctrust.org., for details and directions. 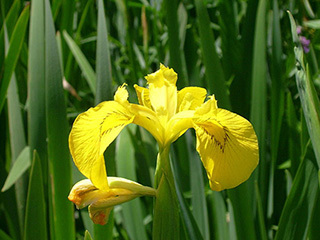 Learn more about yellow flag iris.